My favorite place for watching the Magic Kingdom's Wishes Fireworks show! What is your favorite place to watch Wishes? My friend Amanda from Disney’s Cheapskate Princess and I are starting something new today! Once a week we will offer up competing viewpoints on some of your favorite things to see at Walt Disney World! Today we are looking at Wishes, and comparing our favorite places to watch it in the Magic Kingdom! I love to watch Wishes from Main Street, U.S.A., but I don’t really like to spend a whole lot of time getting a good spot, so I almost never watch Wishes from in front of Cinderella Castle. However, Wishes is Cindy’s favorite fireworks show, so I like to make sure that there is somewhere that we can all get a good view of the fireworks. We saw Wishes a couple of times during our trip in 2010, the year we took Stephanie to Disney World! During one of these times, we were over by The Crystal Palace getting ready for the show. It started, then it stopped, then they said it was cancelled for the night, but then it kicked in all of a sudden. It was one of those rare nights when I was patient, and that patience paid off in the form of this shot, probably the best shot I have from Wishes. 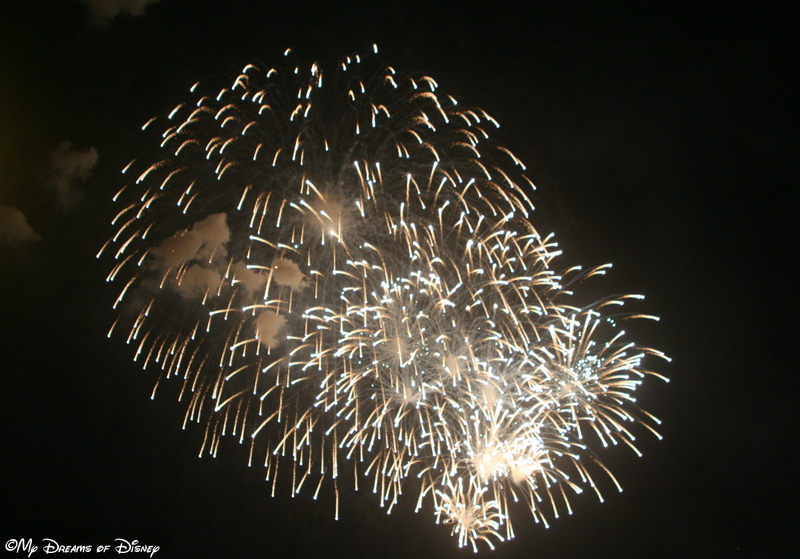 Diehard fans of Wishes will recognize this as the Summer Nightastic Fireworks show that ran during the summer of 2010 instead of Wishes. The quality of the shots isn’t the best, but watching while riding the ride added a dimension that I found to be extremely cool! If you’ve never done it, go try it out. It’s fun, and the line is non-existant too! On one trip I was able to get some shots of Wishes from over by the Liberty Belle. 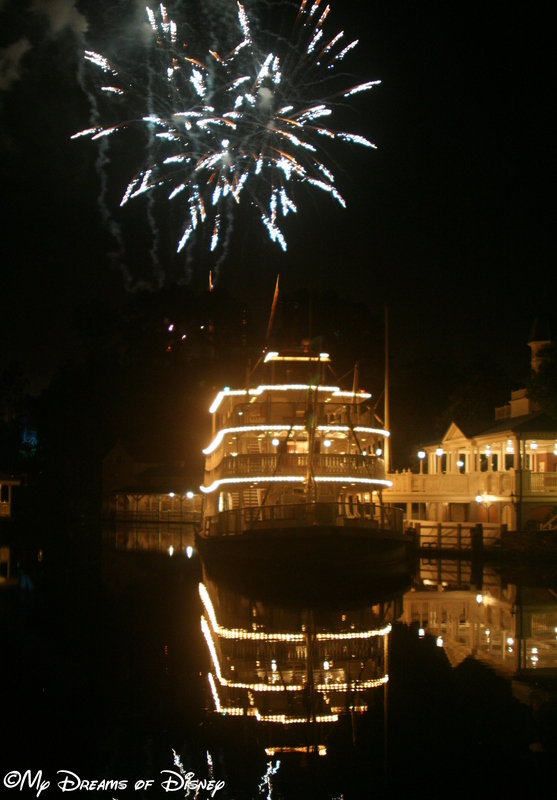 When the fireworks are getting ready, the Liberty Belle draws into port for the night, so I was able to get this photo (and many others that didn’t quite turn out) with the water and the boat. 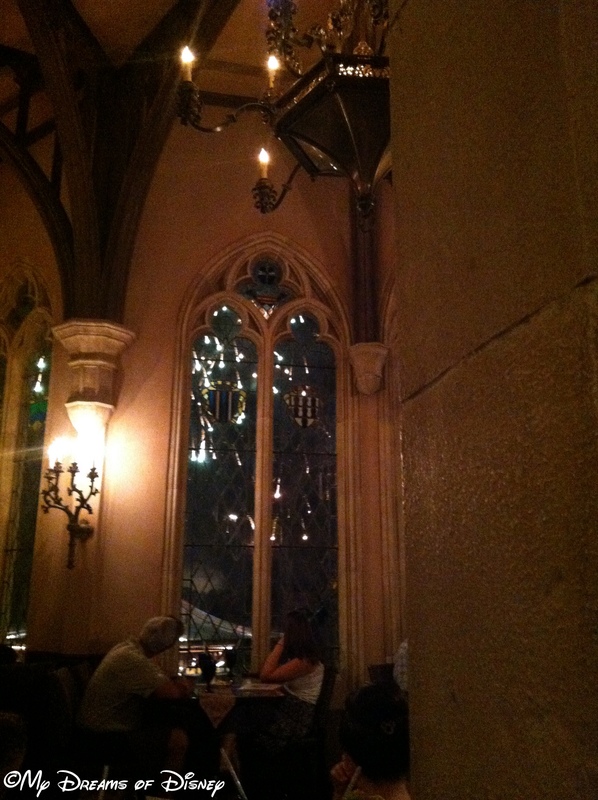 However, by far the coolest place that I’ve ever witnessed Wishes was from inside Cinderella Castle! The fact that we were able to do this was purely accidental. We had an 8:40PM time for dinner that night, which, when I made the reservation, I thought was too late and not a good time for dinner. However, I took it because it was a one of a kind trip for our party. 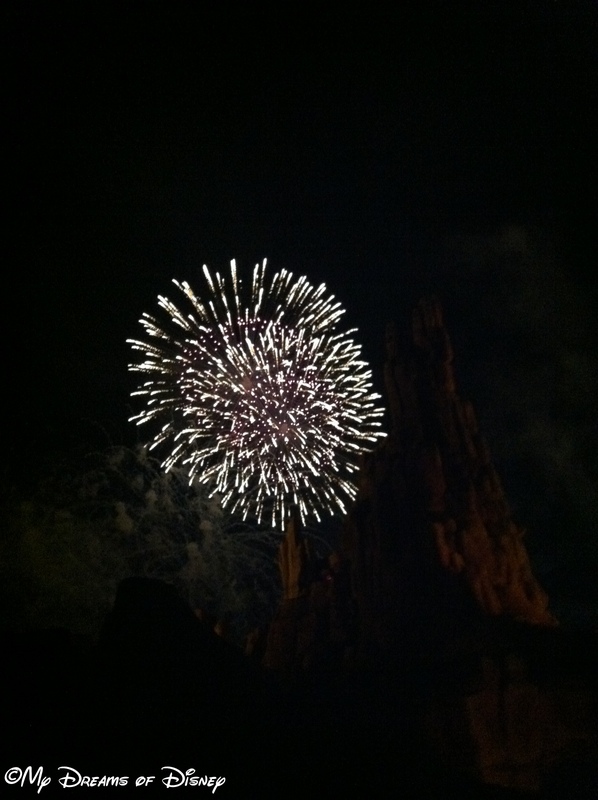 While we were eating, all of a sudden an announcement was made that the lights would dim, the music would play, and that we would be able to hear the sound of the show and see the fireworks out the windows! 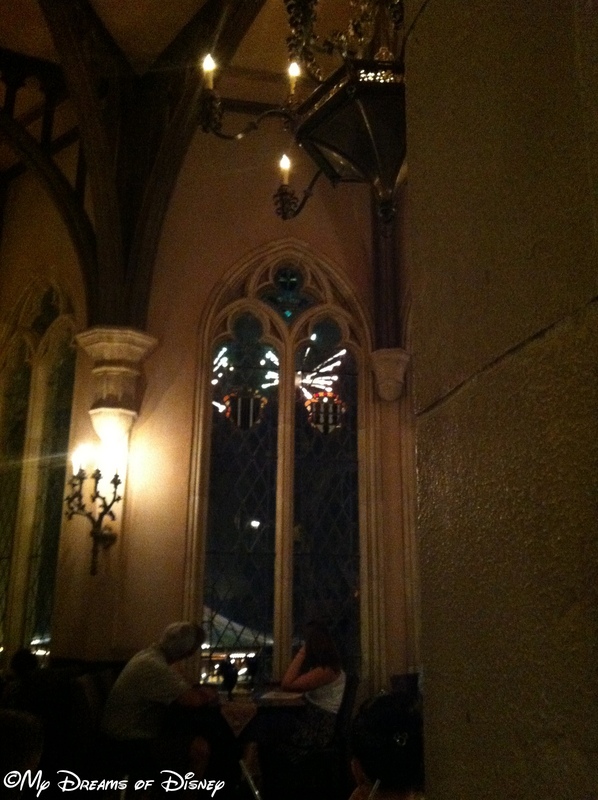 Unfortunately, our party was large enough that we weren’t by the windows, but we could see out them from our table. I was able to get these last two shots during that time. While not the best, it was still a memorable night that I will never forget! I hope you have enjoyed seeing my favorite places to watch Wishes! Now, head on over and find out where Amanda, Disney’s Cheapskate Princess, likes to watch Wishes from! 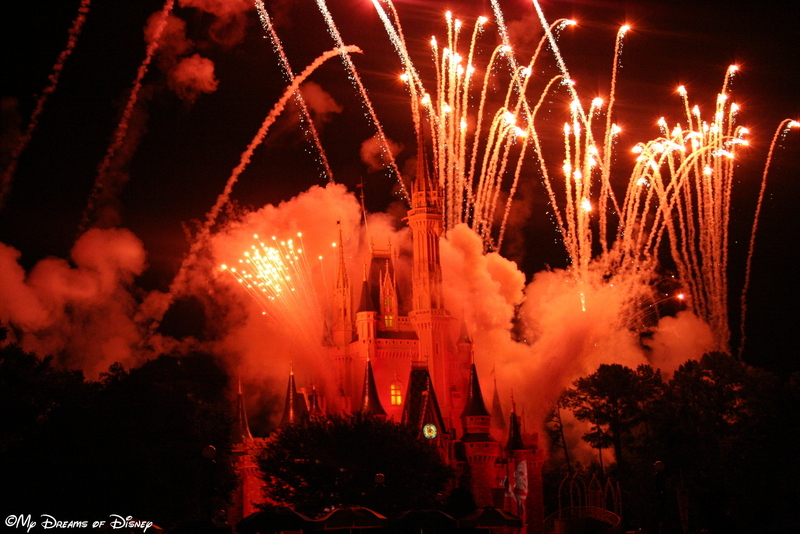 What is your favorite location to watch Wishes from? Why not tell me in the comments below! Thanks for stopping by! What a beautiful view from inside the castle! 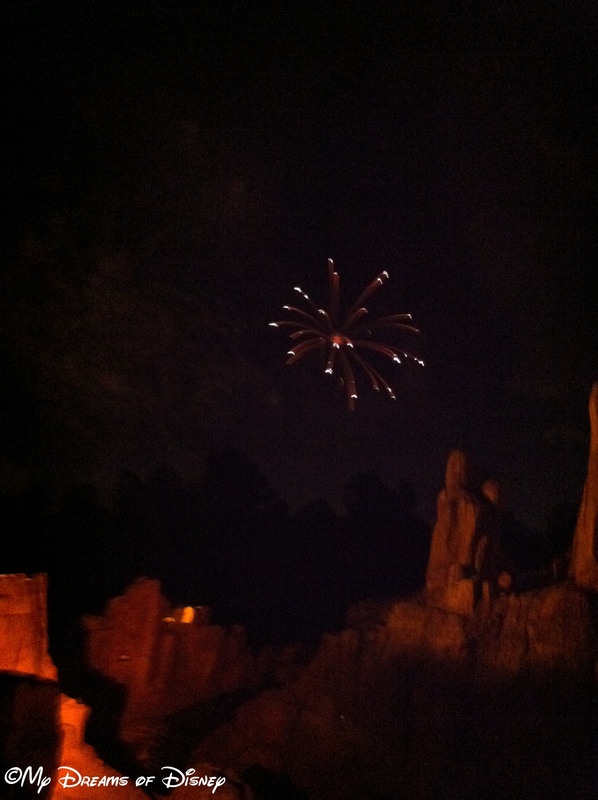 We “accidently” saw the fireworks at MVMCP from BTMRR. My daughter was riding and I was waiting. We both thought it was the best fireworks view that’d we’d ever had! we were able to get into the fireworks dessert buffet at tomorrowland terrace. That was spectacular. Previous Post: Tiggerific Tuesday Trivia — This Day in Disney History! Next Post: Wordless Wednesday: Disney Architecture!